Anthony Woodburn deals in fine antique clocks - 17th & 18th century English antique bracket clocks, longcase clocks and antique barometers, including pieces by TREGENT, London. A fine George III ebonised and brass moulded bracket clock. The inverted bell top case retains the original pierced and engraved frets to the sides, front and rear. All primary mouldings are brass and the case stands on brass ogee feet and is surmounted by a single carrying handle and four corner pineapple finials. The break arch brass dial is mounted with rococo spandrels, silvered chapter ring and a plaque in the arch signed by the maker flanked by subsidiary dials for strike/silent and rise and fall regulation. The centre is finely matted with a false pendulum aperture, a further aperture to view the day of the week and well pierced steel pointers. The twin fusée, eight-day duration movement retains the original verge escapement with hour strike sounded on a bell. The backplate is delicately engraved in a rococo style. 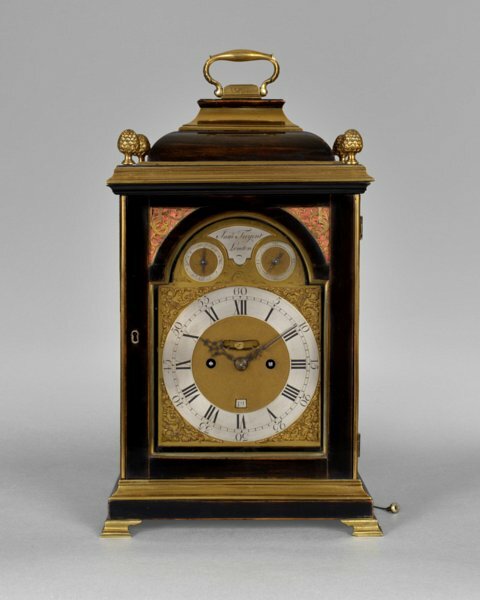 James Tregent is recorded by Baillie as watchmaker to the Prince of Wales and examples of his work are included in the Victoria and Albert Museum, Science Museum, Gild Hall Museum and several famous collections.